Let the editor wars begin! No one says that a GUI editor has to have lots of features. It can be very lightweight and simple, which is exactly the focus of Leafpad , the default editor for the LXDE environment and Xubuntu 11.10 and 12.04. If you have used Raspbian on a Raspberry Pi, you probably have used Leafpad. Figure 13: Leafpad 0.8.18.1 on CentOS 6.8. I started using Leafpad on Raspbian with a Raspberry Pi 2, and I found it to be very useful and quite fast. I've been using it on my Linux laptop as well. The first GUI editor I used was NEdit (Nirvana Editor)  on SGI workstations running IRIX. It was originally developed at Fermilab, but the version today on Linux was developed as an independent open source project with the GNU GPL license. NEdit was built using the Motif toolkit, which was very popular when it was released. 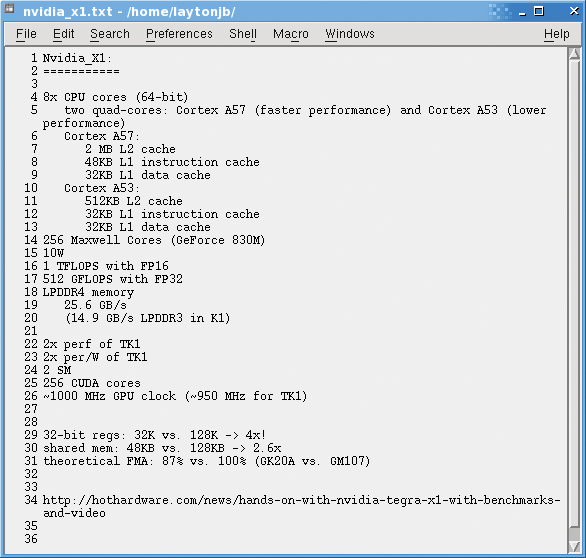 I used NEdit on Linux for many years to write a great deal of both code and text. According to the Wikipedia article, development of NEdit stopped in 2010. With few updates since, the last release was version 5.6 in December 2014, which was 10 years after the release of the previous version. NEdit (Figure 14) comes with many features, including bracket matching, syntax highlighting, line numbering (basically mandatory for a text editor), a very good search and replace function with which you can use regular expressions, macros, block selection of text (i.e. specified rows and columns), and my personal favorite, column cut/copy/paste capability. If you look around the web a bit, you will find lots of people who recommend it highly, but be aware that NEdit still relies on Motif, which is slowly giving way to more modern toolkits. Figure 14: NEdit on CentOS 6.8. 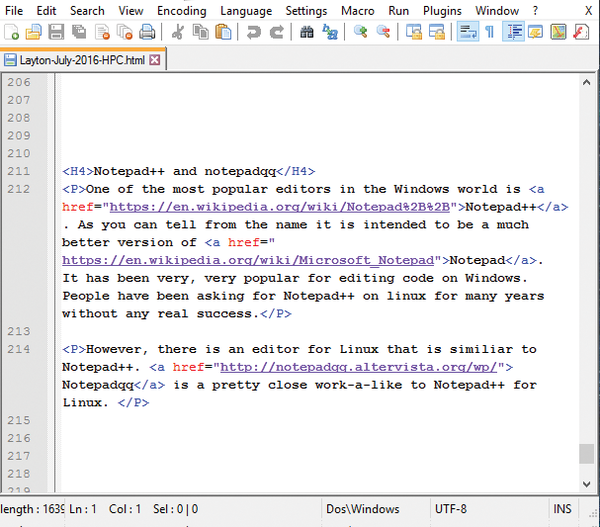 One of the most popular editors in the Windows world is Notepad++ . As you can tell from the name, it is intended to be a much better version of Notepad, which has been very popular for editing code on Windows. Notepad++ has split-screen editing, a tabbed document interface, a spell checker, syntax highlighting, code folding, brace matching, macros, and several other features common in editors. It supports a large number of languages for syntax highlighting, including Fortran (the true language of HPC kings), Matlab, Python, and Perl. People have been asking for Notepad++ on Linux for many years. The code is open source and uses the Scintilla editing component. However, it uses some pure Win32 and Standard Template Library (STL) functions, so it doesn't port easily to other platforms, although a few attempts have been made without any real success. 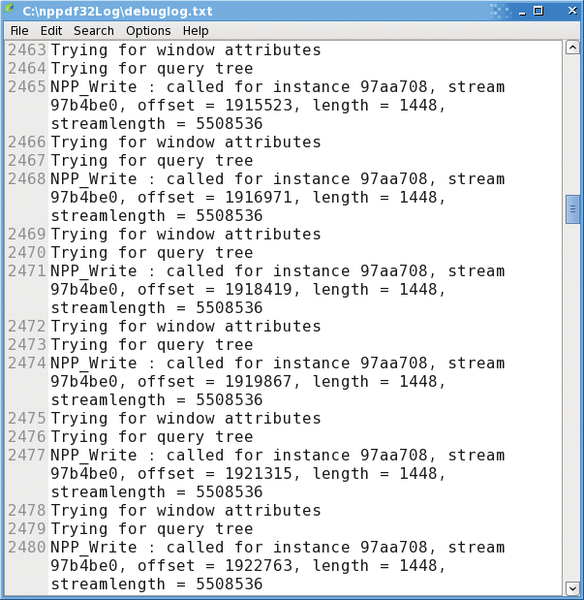 Figure 15: Notepadqq on Windows 10. Editors, particularly command-line editors, are an important tool for high-performance computing systems administrators. We point out some editor options with little to no bloodshed. Continuously monitoring the performance of applications helps ensure the service quality in multilayered cloud services. A REST API is especially useful for a developer if the API provider extensively documents the methods used. The Swagger tools not only semiautomatically generate an API reference, but a matching client SDK for many programming languages, as well.